"Close to the gardens of the España plaza in Madrid is situated the Mughul Indian restaurant, a great ambassador of Indian cuisine. Its decoration has warm colors and traditional objects that give it a cozy touch and make you feel at ease. The menu of this restaurant brings you simple starters to more elaborate dishes, based on the country's culinary traditions. We highlight the samosas, or the yummy shrimp tandoori. The desserts are an explosion of exotic fruit flavors. 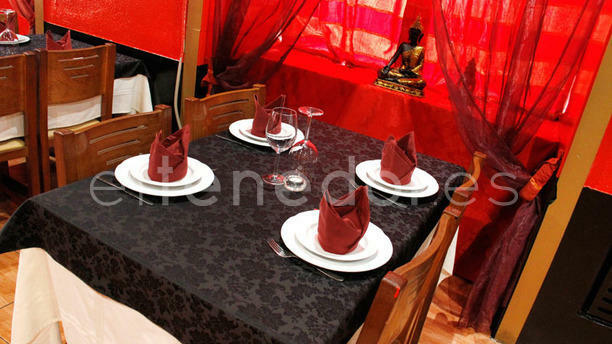 As a couple or with friends visit Mughul Indian, a place full of charm where the decor, attentive service and authentic cuisine, will transport you without having to travel to the other side of the continent." Love the food... great taste and well spicedJust great and the service... One of the best i ever had. Just great!! Atmosfeer of the restaurant is not that cosy but the good and service makes that 100% good. I would recommend this restaurant for sure! Very professional and accommodating. The gentleman took the time to explain the subtle differences between some dishes in English to some of my colleagues. It was one of my best experiences with Indian cuisine. The food is consistently good and the staff always friendly and welcoming. The chicken did not taste good. Best Indian restaurant in Madrid! Delicious and lovely service. Will be return! Some friends and I decided to try a local spot for Indian food and were pleasantly surprised. The dishes were all fllavorful and there was plenty to choise from on the menu. I lean into vegetarian choices and enjoyed the spinach sag panir and the lentils. My friends had tandoori chicken with onions alongside and found it to be flavorable, too. The wait staff and chef are very accomodating, answering questions as needed. Reasonably priced. I would return to try other selections. Muy amables y atentos. Repetiremos, seguro! All diches were very nice, a good traditional Indian restaurant.